This TI-5045 IIA followed the original TI-5045 II and introduced a sleeker design. 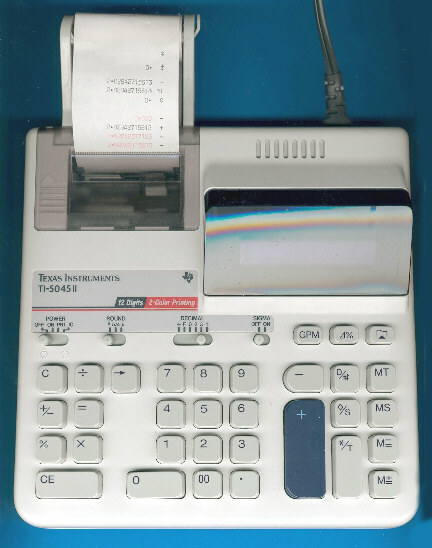 Within three year the TI-5045 IIA was replaced with the TI-5045 SV (SuperViewTM). The internal construction of the TI-5045 IIA is similiar to the original TI-5045 II. Please notice the similiar TI-5035 II replacing the internal power supply with batteries. The UL-File number E42662 of the calculator reveals it as a product manufactured under a contract from Toshiba TEC Corp. The leading "Z" in the date code gives with Zeny Corporation the assembly plant of this calculator.